You ever wonder what to do with leftover rice ! Well, here is a recipe that I just love to make since it’s super quick to make and all the ingredients are always readily found in my kitchen and the best thing is that I can use up my leftover rice and make it flavorful. I always knew about Lemon Rice but wasn’t so kin on making it …To be honest I never was a rice fan. Before I got married I would try to avoid rice as much as possible. But after marriage since my husband is a great fan of rice ….I was making it on a daily base for him so then I got use to it and now I love it! I’m always finding different ways to make rice so the whole family can enjoy it especially the my kids. 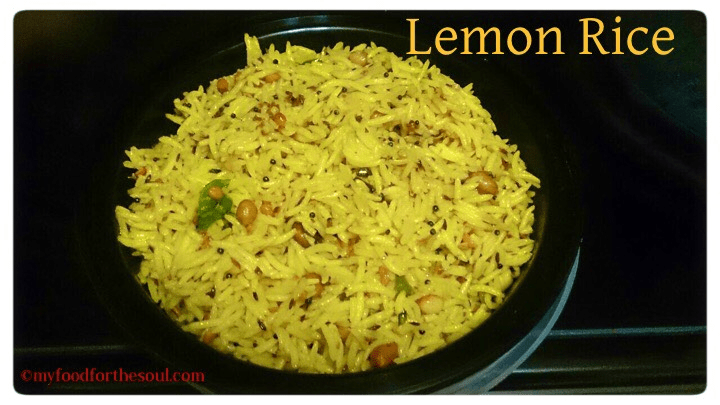 Lemon Rice also known as Puliyodhara or Puliyogare originated from South India. This rice has a sour taste but it’s very flavorful. It can be made with freshly made rice or leftover. The crunch from the peanuts and cashew nuts make it tasty. Adding fresh Curry Leaves (kadi patta) brings out the a sinful aroma. Lemon Rice is a great lunch or snack idea. If your running out of time then this dish can be put together in no time. Heat the oil in a broad non-stick pan once hot add the mustard seeds and asafetida. When the seeds crackle, add the urad dal, chana dal and sauté on a medium flame for 1 minute till light brown. Add the peanuts, broken cashew nuts, ginger, green chilly, dry Kashmiri red chillies and sauté on a medium flame for 30 seconds. Add the fresh curry leaves, turmeric powder,lemon juice and salt and rice. Mix well and cook on a medium flame for 1 to 2 minutes, while stirring continuously. Remove from flame and add in chopped coriander and mix well.